Westboro, Mass. 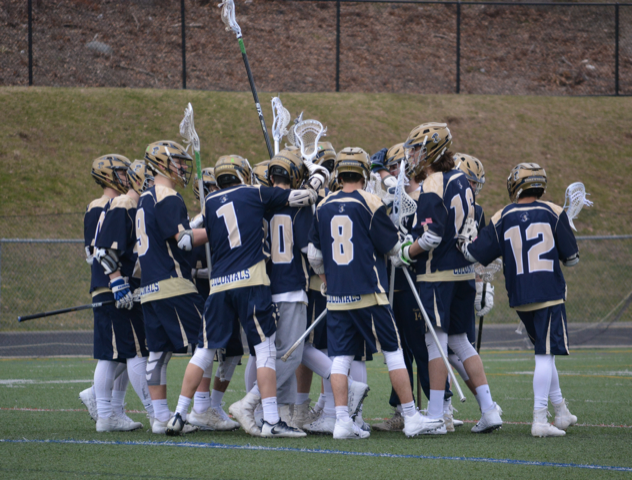 - A lack of turf, and uncooperative Massachusetts weather has kept Shrewsbury from playing a game for 12 days, but the Colonials weathered the storm and came out on top Tuesday against Westboro, topping the Rangers 19-3 to open up Mid-Wach A play. “For years, we’ve had a hard time winning at Westboro," Shrewsbury head coach Nate Skermont said. "It was important to get to 1-1 and 1-0 in the league. We haven’t played in 12 days, we haven’t been outside to practice. We expect to keep getting better everyday, so this was a nice win. I thought fundamentally we played good lacrosse, and now we gotta hold ourselves here and get better everyday." The Colonials opened the game strong off a face-off win from junior FOGO #3 Mason Kohn (4G, 3A), who then went down the field and scored right away. Kohn scored a second goal about a minute later to make it 2-0 early for the Colonials. “I think it starts with our FOGO Mason," senior captain Chris Campbell said. "He gets the energy up right away by winning the face-off and going down and scoring like that. He’s dynamite on the face-off draws and you know, that’s a huge help for a team like this. If you go down in Westboro it’s hard to come out, but if we go up early and get the momentum on our side, it’s definitely helpful." Campbell was sent to the box for a minute early, and Westboro took advantage when #12 Brendan Gately found the back of the net to open the scoring for Westboro. #21 Cole Russo scored for Shrewsbury, followed by #21 Martin Moran of Westboro to make the score 3-2 Colonials. #1 Kyle Spagnuolo (4G, 2A) added another goal to make the final score at the end of the first quarter 4-2 Colonials. The second quarter was all Colonials as Shrewsbury went on a 5-0 run in the period. Spagnuolo ended the 1st, and started the 2nd with a goal, making it 5-2 Colonials. Then, #3 Mason Kohn completed the hat-trick, followed by #6 Alex Cashman (2G, 2A), #9 Campbell (1G, 1A), and #21 Cole Russo (4G, 2A). Score at the half was 9-2 Colonials. The third quarter was also a show for Shrewsbury, as 6 different Colonials scored goals (#21 Russo-2, #22 Ryan Haley-1, #8 Sam O’Connor-1, #1 Kyle Spagnuolo-2, #6 Alex Cashman-1, and #4 Alec Buduo-1). #9 Declan Gardner scored the lone goal for the Rangers to make the score 18-3. Haley scored the lone goal in the 4th quarter to end the scoring. “I think we just had our heads on straight," Campbell added. "We knew the first game against Littleton was just a hiccup. Passing and catching was good today, we stayed calm defensively, and we just made good plays all around." “I thought the slides were good, but we didn’t have to slide much, so our on ball defense was nice," coach Skermont said. "But, whenever we needed a slide it was there… (#30 Mike Fornal) did a nice job in goal. The communication was there, and the slides looked good because we’ve been working on them in practice." Shrewsbury advances to 1-1, and 1-0 in Mid-Wach A play. The Colonials will look to carry that momentum into Thursday's home league game against Wachusett. Westboro, meanwhile, falls to 1-2, and will look to bounce back Friday against Mid-Mass. foe Tantasqua.